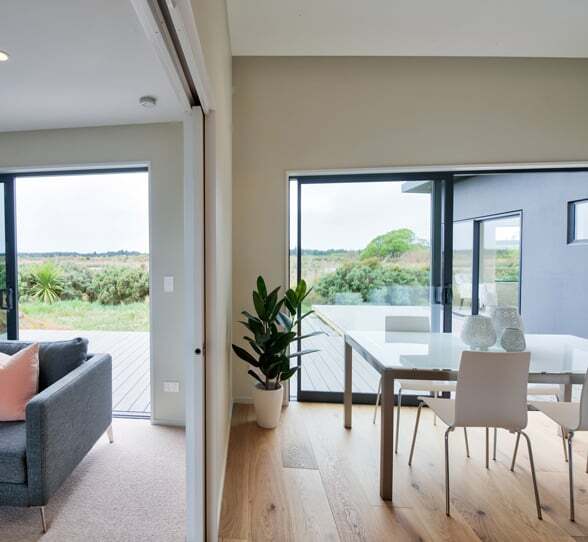 With input from our clients we designed this modern home, which is located in Pegasus to the north of Christchurch. This home is perfect for entertaining guests as it features an impressive kitchen as well as superb indoor and outdoor flow. Key elements which help give this home the modern, coastal look our clients wanted include the monopitch roof and the unique combination of dark plaster and natural pine shiplap cladding. These striking design features are an excellent fit with the home’s location overlooking the tidal estuary out to the beach. Other notable features of the home include raking ceilings in the kitchen, living and dining areas. 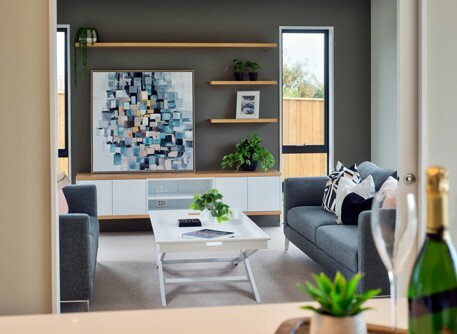 Despite its distinctive style features, the build of this 3 bedroom plus study home progressed quite quickly and exceeded the client’s expectations around the timeframe involved. Having an internal double garage such as this home does is more cost-effective than opting for a separate garage since there is no need for a separate foundation and roofing. For our client, the hardest part of the entire process was making decisions on the fittings and fittings. And it is a big decision, so our stylists were available to help out there as usual. This is a custom designed, 3 bedroom family home with a study and inbuilt double garage. If you like this you might want to browse our Timbermode range of homes. They can be built straight from the plan, customised to suit your own needs, or even 100% custom designed like this one. Downloadable buyer guides and a full list of inclusions are available on all house design pages. And if you see something you like, simply enquire and we’ll send you further information including prices. Nice – seize the moment and start the conversation now!